Newcastle Vikings’ delayed start to the 2018/19 season eventually gets underway this weekend when our men’s team travel to play the University of Leeds in their opening Regional League North fixture on Saturday 20th October 2018, having dropped back down a division after a hard season up in the National League North last year. After winning our first Regional League North championship last season, as well as picking up further silverware at the summer British Beach Handball Championships and pre-season EK82 Tom Cooper tournament, our women’s team have to wait another couple of weeks to begin the defence of their title, away to last season’s runners-up and regular past winners Liverpool on Sunday 4th November 2018. The same day will see our men travel to take on Manchester II. Following another away game against the University of Leeds on 17th November 2018, our ladies’ first home league match of the season will be the return fixture against Liverpool on 2nd December 2018 at Temple Park Leisure Centre. 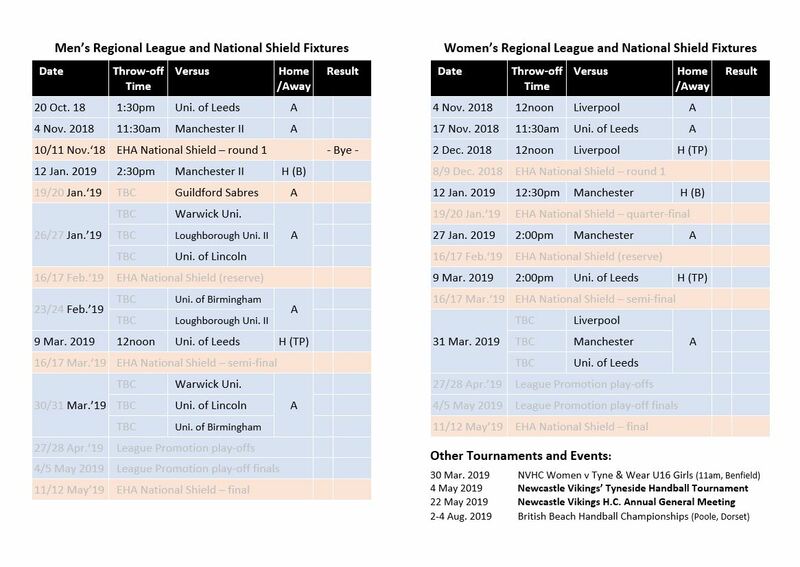 The late withdrawal of the University of York from both the men’s and women’s leagues meant the England Handball Association had to rethink the regional leagues structure and fixtures calendar, as it had left just three teams in the men’s North league and four in the women’s North league. For the men, the preferred option was for the North and Midlands leagues to belatedly re-merge into a single North-Midlands League of seven teams, thus now also including the Universities of Birmingham, Lincoln, Loughborough II and Warwick. However, while the three North teams will play each other on a home-and-away basis (and similarly for the four Midlands university-based sides), the fixtures between the North and Midlands clubs will be played in a shortened format over three tournament-style days at neutral centralised venues on the weekends of 26/27 January, 23/24 February and 30/31 March 2019. Our Vikings men will therefore only have two home league matches this season, on 12th January 2019 against Manchester II (at Benfield Centre for Sporting Excellence) and on 9th March 2019 against the University of Leeds (at Temple Park), with both days seeing enticing double-headers with the corresponding women’s home league fixtures. Our ladies’ other full away fixture against Manchester is set for 27th January 2019. Their league season will round off with a tournament-style day of shortened matches against all three other Northern league clubs on 31st March 2019. In the knock-out competitions, we opted to enter both our men’s and women’s teams into the EHA’s second-tier National Shield competitions, which also feature the first-round losers from the National Cup. The draw for the 11-team men’s Shield took place on Tuesday and saw Newcastle Vikings gain a first round bye, thereby taking us straight through to the quarter-final stage when we have been drawn away against South East Regional League A club Guildford Sabres who were only established in 2017. The long trip south to Surrey is scheduled to take place on the weekend of 19/20 January 2019. The draw for the 12-team women’s National Shield is due to take place on 13th November, with our Vikings ladies anticipating a potential first round tie taking place on the weekend of 8/9 December 2018. In the junior ranks, with not enough age group-eligible junior players this year, we have unfortunately had to take the tough decision not to enter girls or boys teams in the EHA leagues this season, including our Tyne & Wear County Handball Under-16 girls team. We are nevertheless hopeful we can attract enough new players to enable us to attend a few of the North West junior handball league tournament days and to arrange some friendly games against other English or Scottish clubs. In the meantime, a Vikings juniors mini-tournament will take place on 2nd December 2018 following our senior women’s home match against Liverpool, with junior county matches lined up for 23rd March 2019 before the Under-16 girls take on our senior women in a friendly game on 30th March 2019. Finally, our annual end-of-season Newcastle Vikings’ Tyneside Handball Tournament is scheduled to take place on Saturday 4th May 2019. Check out our full fixture card below. Here’s to a great 2018/19 season ahead! Best of luck everyone, and as always… Go Vikings!